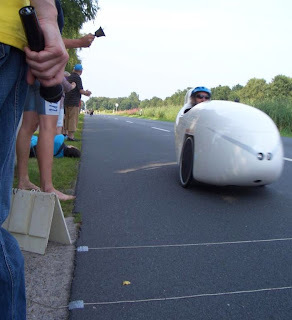 Last weekend a group of us from Sinner went to Leer in Germany for the European recumbent having championships. Full results can be found here and more photos and videos are here. The photo comes from Joachim's gallery and shows me in the Mango going over the line in the 100 km race. Someone is ringing the bell to indicate there is just one more lap. In this race I came 22nd out of 65 averaging just over 40 km/h. In the one hour race I managed 42.3 km/h, which was good enough for 30th place out of 56. Children inspecting a variety of different coloured Mangos, two of them having just finished racing. Racing velomobiles through city streets? This is very cool. Thanks David.